As mentioned in my previous reviews of Taj Mahal Hotel (Narayanguda; SD Road), amma and dad happen to be fans of TMH. So when we got to know that these guys opened their new branch in Jubilee Hills, there was excitement, which eventually made us drop by for dinner on a weekday. The place looked fancy when compared to the other branches, and pretty busy, mostly because of the large number of stewards and waiters. They had huge hard-bound menus, and it took us a while to digest their offerings, for almost every item of their South Indian fare was priced exorbitantly. A single cutlet which costs less than 50 bucks at any other TMH in town, was priced at 90 (+taxes). Anyway, I ordered it for amma, apart from the Ghee Karapodi Idli for dad, and Chole Bhature for myself. I also wanted to try one of their continental offerings, so ordered for Cottage Cheese Satay. While we wait for our food, we had to shift tables for the mats on ours were stinking, thanks to the food stuck onto them which wasn’t cleaned properly. When we informed this to the steward and waiters, all they did was stare at the food stuck onto the mats and smile, instead of cleaning them. When we moved to a different table, they began to treat us as new customers and again came to take our order. Total chaos it was! Once things were sorted, our food came by. Dad seemed to like the idli. I tasted the sambar, and it was pretty decent. 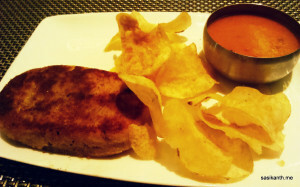 The Cutlet came in next, with some chips and the special sauce. The cutlet tasted good, as it should have been. However, the sauce wasn’t up to the mark for it was too thin and lacked expected flavour. 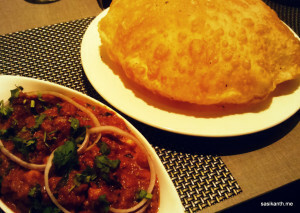 I ordered for Chole Bhature mainly to compare it with what is offered at Chutneys. And it was comparable. While the Bhature was a little thicker than I’d prefer, the chole tasted tangy and yummy. The quantity too was sumptuous. The best part of the meal unexpectedly turned out to be the Cottage Cheese Satay. 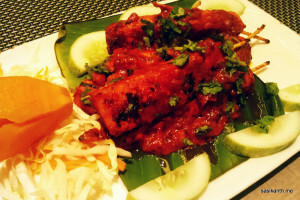 Six large chunks of paneer perfectly marinated in spicy peanut based sauce served with more peanut sauce; yummilicious. The paneer was super fresh and the peanut sauce was finger licking good. In fact, I asked two extra portions of the sauce, it was that yum. Overall, a good meal. Almost every item tasted good, with the Satay turning out to be the best. On the downside, the service was terrible. They had about 20 people waiting tables, which made the place crowded. And there was absolutely no coordination among these guys. They guy serving water at the next table won’t attend to us cos it wasn’t his table, it was that bad. All this in addition to the inordinate pricing. Yes, the restaurant is in a prime location, but you can’t be unreasonable. 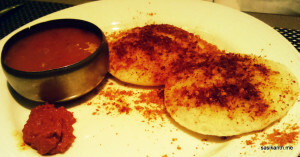 The prices of their South Indian fare is almost 15-20% higher than the surrounding Chutneys or Minerva Coffee Shop. And surprisingly, everything else on the menu was reasonable. Bottom line, unless you’re coming in for the North Indian or Continental fare, it’s better to visit the other TMH in town. PS: We realized after reaching home that they billed us incorrectly. It was supposed to be around 800 bucks but they billed us only for 551. Again, this shows how incompetent their service was.